Overwhelmed by trying to save enough for your kids’ college? As with your other financial goals, saving regularly and consistently is key. One way to do this is through automatic, recurring contributions (known as an automatic investment plan or AIP). When you set up an automatic investment plan, you have the option to increase the amount annually by a set amount. That incremental step-up lets you ease into the plan and save more when you’re able. It also removes the willpower factor and allows your money to benefit from dollar-cost averaging and compounding. Compounding. When your investment earnings are added to your principal, it forms a larger base on which future earnings may accumulate. The more time your money is invested, the more compounding can work for you. If your investments return 6% annually, you could potentially double your investment about every 12 years. The following chart shows how earnings can build over time and make up a big percentage of your college fund. If your family decides they want to save $50,000 toward higher-education expenses, how much do you need to contribute to your 529 plan account? 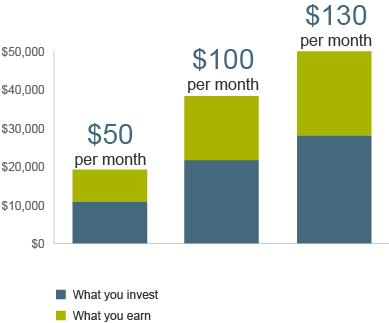 Figure 1 shows the potential growth of your savings over 18 years at monthly contribution amounts of $50, $100, and $130. Note: This hypothetical illustration assumes monthly contributions for a period of 18 years and a 6% annual return. It doesn’t represent any particular investment nor does is account for inflation or any taxes or fees payable or due upon distribution. The rate is not guaranteed. There may be other material differences between investment products that must be considered prior to investing. Figures are rounded. You’ll likely need to save at least $130 per month for 18 years. Your investment earnings could help you reach your goal. You should save whatever you can, even if it’s less than $130 per month. Any amount you save is that much less your student will need to borrow. As your child gets older and closer to college, you can adjust your contributions to stay on track. You may want to increase your contributions at different times in your child’s life. Many families find themselves playing catch-up as their child nears college age. Log on to nysaves.org and select Contribute in the right-side menu. Select Electronically from your bank account and the student account. Enter the amount, the frequency of your contribution, and the start date. Answer Yes to Would you like to automatically increase this recurring contribution annually to start automatic increases. Whether you plan to fund your child’s full four years, or just pay a percentage of the cost, planning ahead can give you peace of mind. That means you can turn your attention to the more important things in life—like enjoying those children who will be heading off to college in the blink of an eye. *Dollar-cost averaging does not guarantee that your investments will make a profit, nor does it protect you against losses when stock or bond prices are falling. You should consider whether you would be willing to continue investing during a long downturn in the market, because dollar-cost averaging involves making continuous investments regardless of fluctuating price levels.